Since we first put our Massage Guide together there's been quite a few changes and new products added to the line so we thought it was time for a refresh! You'll now find even more great massage products down below, each one delivering exceptional results and being recommended by professionals. We've also new heating and cooling massage products, perfect for warming up muscles before an event, or cooling down afterwards to help with recovery. When looking for a massage product there’s quite a lot to consider. Will your clients like the product? how well will it work? is it a good price? and most importantly will you be confident and comfortable using it? After all, you’ll be in contact with the product more than anyone else. Which Massage Medium Should I Choose? Firstly, it’s a good idea to look at the type of treatments you will be providing and who your clients are. Each massage medium offers different benefits designed to suit your requirements. Choose from oils, lotions, cremes, waxes and gels. Let's begin with oils... The benefits of oil include its ability to be absorbed and deeply nourish the skin. Massage oil provides a high level of glide allowing your hands to sink deep into the muscles, which is great for sports and full body massage. It is also wonderful for relaxing spa treatments, it is available in a range of therapeutic scents and complexes to offer your clients a pleasant calming experience. Oil also warms up quickly to provide a comforting sensation for your treatments and remember, a little oil goes a long way so it's a very cost-effective option! 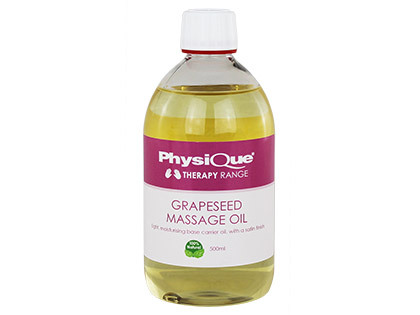 Massage oils are available in a few varieties to suit your needs. The most popular are pre-blended oils, containing essential oils that help to contribute a number of reactions to your client, such as stimulating circulation as well as aiding recovery and relaxation. All of our pre-blended oils feature fragrances that appeal to both and women. 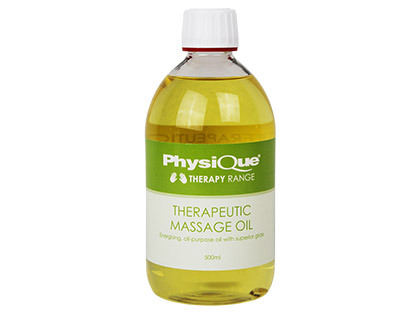 Our Physique Therapeutic Massage Oil contains 100% pure essential oils, lavender, peppermint, rosemary and verbena. Perfect for all types of massage, the energising scent is also a firm favourite with customers and patients. Another blended oil is Physique Water Dispersible Massage Oil. Unlike traditional oils, this simply rinses off skin, clothes, towels and covers with water. A favourite with many customers as it provides an exceptional glide and an uplifting aroma with no mess. Making your own unique massage oil can be a very rewarding experience, especially when you hear and see the positive results from your clients. Combining essential oils to create a blend that is therapeutic as well as high in performance is easily achievable with our base oils. We have a large selection of essential oils for you to make your very own massage oil. We have a couple of choices of base oils to help you create your unique massage oil - both are wonderful carrier oils for you to add essential oils to make the perfect blend. Grapeseed is suitable for patients with nut allergies and has a light, satin-like finish. Sweet Almond delivers exceptional glide that doesn’t absorb heavily into the skin. Physique Cologne is a pre-and-post massage skin cleanser - ideal wherever fresh water is unavailable and a spirit base is required to lightly cleanse the skin. It efficiently removes oil from skin following an oil based massage and prevents oil residue absorbing into clothing following massage. 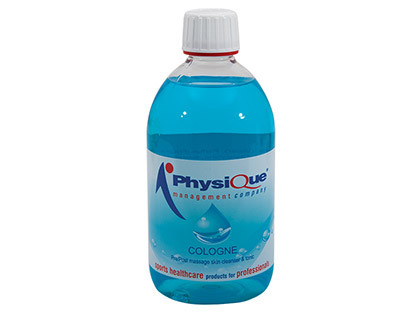 With a light refreshing aroma, Physique Cologne can also be used to clean excess oil from your treatment couch and work surfaces. With a light consistency, massage lotion will provide a medium glide that is perfect for deep tissue massage. Many therapists prefer to use massage lotions when working with hairy clients as it doesn’t mat the hair and obstruct your massage technique. Although lotion is absorbed slower than oil to the skin, it also provides nourishing properties, giving a pleasant feeling to your client after treatment. Our massage lotions are non-sticky which can be a bit easier to use than oil when it comes to the clean-up process after treatments. Lotions also feature natural preservatives such as vitamin e which helps to prevent rancidity. 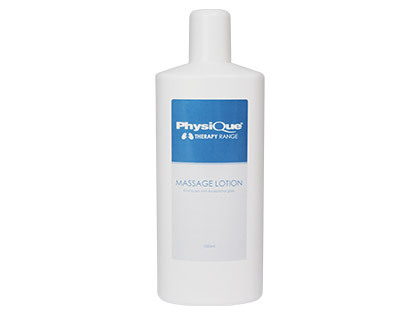 Physique Massage Lotion is a superior lotion, enriched with Aloe Vera, Camomile and Vitamin E. Extremely kind to the skin, this lightly oiled lotion is ideal for long gliding massage strokes to give your patient the perfect treatment. Great for all types of massage, including sports massage and also where hairy skin can be a real challenge. Also washes out easily and has a pleasant perfume. 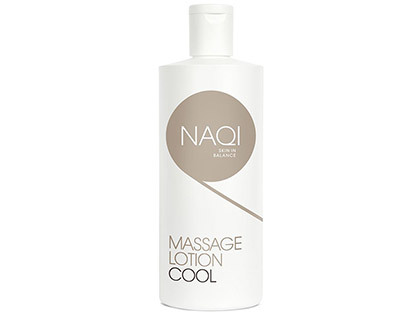 Each very kind to the skin, NAQI provide massage lotions with exceptional glide that are great for hairy skin. Their range includes cooling, warming, light and extra gliding lotions to suit all types of massage, pre and post event. Very similar to lotion, massage cremes offer all the advantages of a lotion but are a bit thicker and are recommended for specific treatments on tough areas of skin. Providing the easy glide of oil and light absorption of lotion, massage crème allows higher friction which is perfect for longer massage sessions, knotted muscles and trigger points. Massage crèmes often have increased levels of oil allowing it to go a bit further than a lotion. Hygiene is a factor to consider using massage crème as they are usually supplied in a tub, as long as you have a dispensing lid or an applicator there are no issues. Our Physique Massage Creme was developed to provide a comforting and relaxing massage. Offering all the advantages of a lotion but goes a little further with increased levels of oil. Our massage Creme ensures the skin remains smooth and relaxed following massage and includes aloe vera, vitamin E, and camomile. 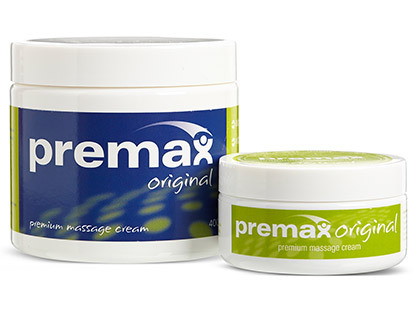 Using the highest quality ingredients, Premax has developed superior functioning massage products that are trusted by elite sports healthcare professionals. Featuring formulated massage products specifically for sports athletes and designed to enhance performance and recovery. Increasing in popularity for therapists, massage wax is a semi-solid formula which melts immediately onto the skin and provides a working surface that delivers control and smoothness. The great benefit of using wax is they provide a strong grip and a low level of glide, this is perfect for deep tissue massage. The initial outlay on massage wax is a bit more than an oil or a lotion, however, a little goes a very long way and there is virtually zero waste with no spills and mess. Formulated from Beeswax, Vegetable Oils and Essential Oils, massage wax is antibacterial, so the shelf life is pretty good. Wax takes a bit more work to get going but for extended treatments, it delivers a great finish. 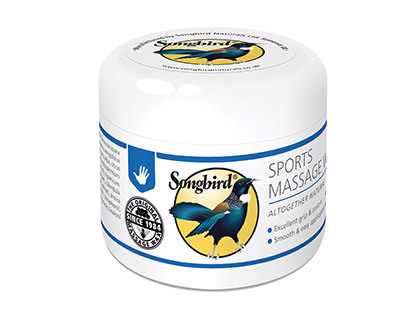 We stock a large selection of Songbird Massage Wax. The best-selling Sports massage wax is slightly runnier than other waxes providing an excellent pre and post-event massage medium. Their Orange Spice wax is a softer wax with warming properties that is great for pre and post events to reduce aches and pains. Unscented wax is a great option for those of you that like to create your own blend by adding your own essential oils. Or if you simply prefer a massage medium with no scent. 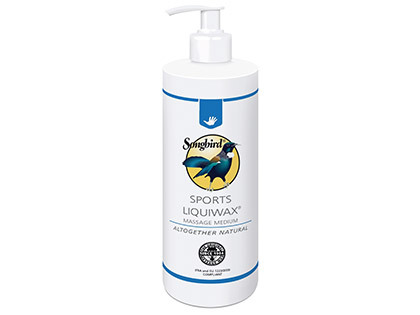 Liquiwax is a version of the classic Songbird Massage Wax that comes in a pump dispenser. It’s somewhere between a lotion and a classic massage wax, it is an entirely new formulation which is perfect for smooth nozzle delivery. Ideal for those looking for a pump dispenser method, and a slightly stronger glide factor in their Wax. 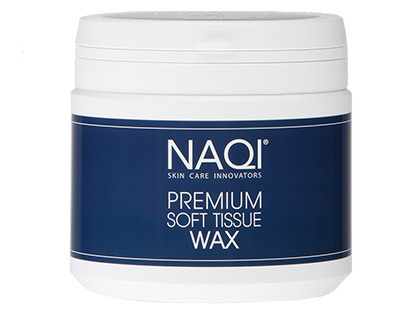 NAQI Premium Soft Tissue Wax is a blend of fine oils carefully selected to guarantee excellent control for soft tissue therapy. The unique formulation optimises the natural skin barrier and provides a hydration boost, resulting in smooth and moisturized skin. A lesser known and used massage medium but one that is great to work with and gives great results. Massage gel is a good alternative to using lotion or oil since it has a way of combining these two elements together. Massage gel moisturises the skin and also assists in creating smoother stroke techniques for light massage. Massage gel can be left on the skin after treatment providing healing properties while nourishing the skin. An advantage to using gel is that is can be applied easily without running or feeling greasy. Also, many massage gels have a long shelf life. Developed with skin care experts NAQI, our new Physique Massage Gel has been introduced as a great alternative to Biotone. Its lightweight complex glides effortlessly over the skin, providing greater coverage than typical massage oils, without leaving behind any greasy residue or unpleasant odours. The water formula allows you to massage at a more rapid rate, creating more friction and heat to loosen tight muscles. Our Physique Arnica Gel is a great addition to the massage experience for both therapist and client. Combining the healing properties of arnica as well as menthol to help activate and stimulate circulation. Apply prior to sports and spa massage, our arnica Gel is quickly absorbed and helps to prevent muscle soreness. If you or your patients are looking to get an advantage over the rest of the competition then a warming massage product is definitely worth trying. With the inclusion of a heating element, these are ideal to help people prepare for exercise and sport by warming up the muscles and also help to reduce injuries. Perfect for cold conditions to help keep skin and muscles warm, they'll be no more excuses to avoid training in the winter. These also provide a comforting and easing massage when a warming effect is required. 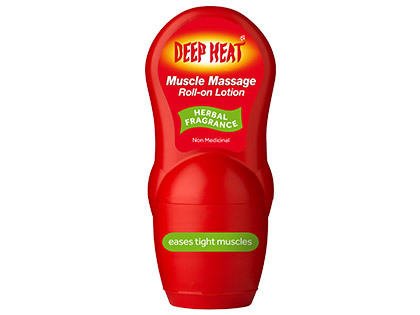 Many of the leading massage brands offer warming massage products in clinic size bottles for use on multiple patients. Available in your favourite mediums including lotion, cream and wax to provide the ultimate treatment, whatever your preference. Perfect for when you're treating a number of players before a game or for a busy clinic schedule. If you're after quick and easy solution to kick-start your muscles before an event or activity, we also have a number of warming up products you can apply to yourself. Whatever level of spice you like, our range of muscle warming products are suitable for everyone. Supplied in a handy size to pack in your kit bag, you'll be ready for action in no time. Recovery is the key to help improve you or your patients' strength and performance. With our cooling massage products you can give your muscles the best chance to recuperate, so you're ready for action quicker. Great for tired and overused muscles these provide deep-cooling relief to your massage. Fast-penetrating, our cooling massage products immediately soothes aching, inflamed, or sore areas to bring overall comfort. Ideal for sports training, physical therapy, or combined with a stretching program. Easy to use and safe for everyone, our cold gels are simple to apply and last for hours, so you only need to apply a few times a day. 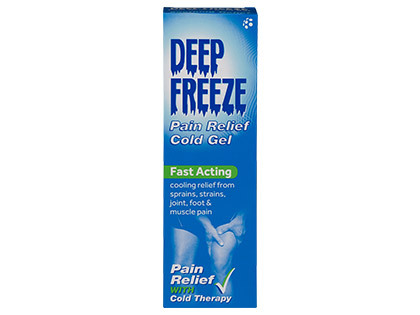 Scientifically proven cooling for the relief from sprains, strains, joint, foot, muscle pain. We believe this is the best range of massage mediums available. Featuring our own Physique brand & NAQI on the 4 for 3 Mix & Match offer, our choice gives you the best deals. You’ll also find an extensive Biotone and Songbird range with new products enabling you to provide the perfect treatments. Balancing performance and quality to deliver the ultimate massage products. Our range of oils, lotion, crème and gel have been developed with professional massage therapists to produce the perfect combination of natural ingredients and optimal gliding properties. Our Physique Massage products are the preferred choice of elite sports teams, massage therapists, training schools and spas. In these high demand settings, it’s crucial for massage products to stand up to the task at hand, Physique massage mediums deliver exceptional results every time and are trusted products to our returning customers. Over the years we’ve continuously strived to maintain the highest standards for you and your clients. Utilising pioneering techniques to craft massage products that are great for sports massage and many other treatments. Our Physique Massage products offer health benefits to the skin and with pleasant aromas, they are very popular with both men and women. With our 4 for 3 Mix & Match deal, you can't go wrong with Physique Massage Oils. 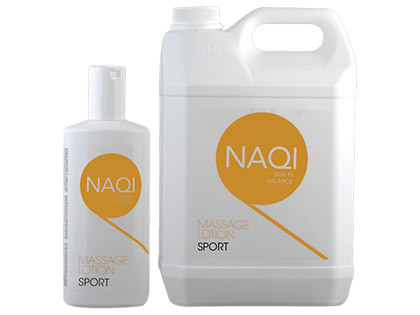 As with all NAQI products, their main objective is to prepare, protect and help the performance of skin. Not only the patients but also with the therapist in mind. And now NAQI Massage Wax is available. Producer of Massage, Reflexology and Fascial Release Wax & Balms. The formulas originally come from New Zealand and incorporate a mixture of Beeswax, Vegetable Oils and Essential Oils. Their products are different to other massage mediums in that they concentrate on a strong, precise grip as a professional necessity. All Songbird Massage Wax products are 100% natural and EU1223/2009 compliant. With a huge selection of products, you’ll be sure to find the perfect massage wax for your treatments. 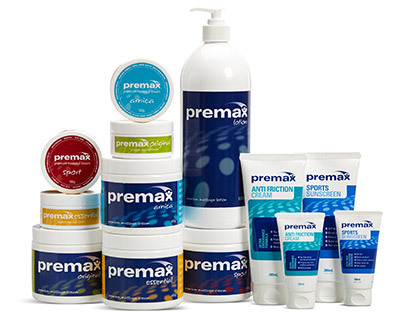 All the way from Australia, we're really excited to introduce the Premax range. Featuring formulated massage products specifically for sports athletes and designed to enhance performance and recovery. Which massage products are suitable to use on someone who is pregnant? All of our Physique Massage oils, lotions and crème are suitable for use in pregnancy. Avoid using the Arnica gel as this contains alcohol. Although none of the NAQI® products are harmful we would suggest using a neutral massage lotion (Light, Ultra, Sport, Medium) for pregnant women. From the Songbird range, both the Unscented or Bee Balm are suitable. In the Premax range, Premax Massage Lotion is suitable for use during pregnancy. Which of your products are paraben free? The Physique range is paraben free, with the exception of Physique Massage Creme. All of the NAQI range are free from parabens and also formaldehyde releaser free. Also, the full range of Songbird and Premax are paraben free. Even in this day and age, it's still a question that pops up every now and then. So just to reassure you none are tested on animals. What products would be suitable to use on someone who has a nut allergy? Physique Massage Lotion, Massage Creme, Grapeseed Oil and Arnica Gel are suitable for therapists and patients with nut allergies. All of the NAQI products we supply are suitable as None of these products contain nuts or derivates. The following Songbird products are suitable, Bee Balm, Unscented and Lavender. What is the average shelf life for each product opened and unopened? Unopened the Physique massage range has a shelf life of 2.5 years. NAQI range. Unopened, 3 years from manufacture date. Opened, 12 months after opening. Songbird products shelf life is 2 years unopened (see date on bottom of tub). Once opened, if it's looked after, ie no heat, dirty fingers and leaving the top off, it should be very similar. Beeswax is a preservative of itself and there are also natural preservatives in the formula. Songbird also turn stock very fast to keep it fresh so the date at the bottom will be very close to the 2 years. All of the Premax products have an expiry date of 2 years after manufacture. I love this product. I trained using it and have used it ever since. All my clients have liked it. I’ve got the oil just in case but I always go to this as it doesn’t absorb into the skin too quickly and it helps glide over clients with hairy legs. Would definitely recommend. Also Physique deliver so quickly, if I’m running low I know It’ll arrive in the next two or three days. Always good stuff though not much purchase with it. My favourite medium. Use this with the majority of clients. Great coverage. Great grip. Easy to clean up. Good for clients skin and mine too! I have used this oil for over 10 years despite trying others at places I have worked and always return to this one. It gives an ideal level of low friction gliding but is thick enough not to require constant re-application. The aroma is pleasant to clients and I have never seen any adverse reaction to it. For me it is the oil of choice. The long lasting glide effect is very good. There is no smell from the product itself and this is a very good point for me. For the athletes, first they were looking supprised that I was using a gel instead of cream or oil but they adapt very quicky. Especially once the massage was done the gel was very easy to remove and the skin had a nice soft feeling. Never been a fan of lotions but this is brilliant. Doesn’t dry up and you jay need a small amount. Will recommend and purchase again! Just bought this to try having used the songbird sports wax/reflexology wax. It's great! Light fresh fragrance, warms in the hand easily, smooth application but not too greasy. Easily absorbed into the skin. Much more convenient to apply than the wax and economical as you only need a little. will be buying some more. I really like this product, it has a light refreshing peppermint scent which clients like. it has good glide on the skin. Economical. I also use the songbird reflexology wax , there is nice glide, not too greasy good for localised areas natural ingredients pleasant subtle scent. I love this oil! it's not too greasy, clients like the refreshing citrus scent of the grapefruit it washes out of towels/clothing easily. Have now bought several of these for my massage therapist to use on me. Gives good enough grip for effective massage but "slippery" enough to not pull hair! Absorbs easily and excess wipes off easily too so clothing doesn't stick for the rest of the day. Washes out of towels etc with no left over smell of oil. This is my go to oil for Sports Massage, some oils are absorbed or wear off far too quickly but even small amounts of this go a long way. Smells lovely and glides really well. All my clients love it too. 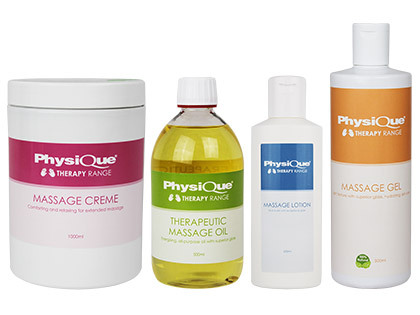 I have been using Physique massage lotion for many years working in the industry as a soft tissue therapist. I have tried several different types in the marketplace from time to time, however my patients have given really great feedback to the Physique lotion and I now use no other! The oil smells delightful which has also been noted by patients. Provides nice consistency for massage, even on hairy backs. I use the therapeutic oil and have done for many years it is great to work with and lets your hands glide over the skin it is none greasy great product for the professional therapist. I have been using this oil for many years in clinic and have found it ideal as an economical option when treating a high number of patients a day. A good blend of slip/grip, which is always a plus for the therapist. Using oil suitable for those with a nut allergy makes perfect sense in a clinical environment and reduces the need for additional products. Quality for general massage after workout. Does not dry too quickly during massage so no 'drag' effect on more hairy parts. I would highly recommend this massage oil. I love working with this oil. It smells lovely, works extremely well on hairy legs, and a little goes a long way. Excellent product. I use specifically for work with swimmers, as it literally rinses off and allows a quick return to the pool. Nice fragrance and great to work with. My only complaint - the bottles/lids leak. The first one I bought came with a lid that sealed (as with the sports cologne), but subsequent bottles have not and they are difficult to transport to events, as they leak at the slightest movement. If it wasn't for this, I would give it five stars. Thanks for the review. Since your feedback we have changed the lids so they are much more secure. There should be no more problems of leaking bottles. Excellent product, it has taken me a while to find a lotion that is a suitable price and that also provides a brilliant glide. A pump bottle would be more useful but the lotion is easily transferable into another bottle. Would be handy if sold in a 3Ltr size as a student sports therapist 1ltr doesn't last very long. I had this oil before and I loved it. However, I've just ordered some after a long wait when it wasn't available and it now smells different. have you changed the ingredients? There was a change in manufacturer early 2014 as the previous company could no longer produce our oil. The ingredients are all the same as before, the blending process is slightly different, hence the slight change. This works well on the majority of clients I've been treating. It smells pleasant, glides well, and leaves the skin nice and soft without that greasy feeling. 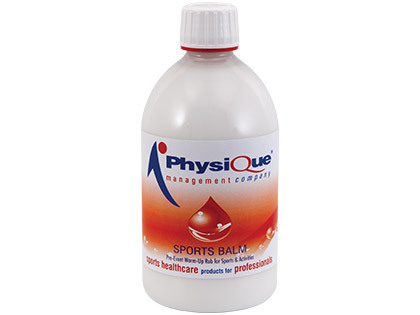 As a sports massage therapist, I find this product one of the best on the market. I had an ACL op in my right knee and was recommded self massage to reduce the scar tissues. This turned out to be much better quality than I thought and it is quite moisturising for my dry skin. I would buy some for friends and family once it's back in stock again. Lotion is excellent quality and long lasting. The only comment I have is that your packaging tends to be rather over the top. This small bottle arrives in a huge parcel with layers of bubble wrap and worm filling surrounding it! You may be able to have a lower delivery charge if the packaging is less extensive. However, the product always arrives in a good state and in a quick time which is hugely helpful. Thanks for your review. We have had a few problems with bottles getting damaged in transit so we now do our best to make sure they are packaged securely to prevent any damage and bottle leaking. The packaging does not affect the post charge for the item. Good as ever. Easily the lotion of choice. An excellent product. A little goes a long way making it very economical to use. Really good quality lotion and the price is really low. Definitely recommend it. Used this for years on myself and have recommended it to friends. Smells great and does the job. Now there are pump dispensers you can fill too, there's no risk of spilling it on the floor! Beautifully soft & silky, unfortunately my girlfriend is sensitive to all oils I have tried, so my masseuse gave me a small quantity to try. Bingo! No reaction whatever, her skin is softer & more supple and it is a pleasure to massage with the lotion far less mess and staining if spilled. Definitely a fan!! Excellent oil. Smells nice and most of all comes out of sheets with no problems at all! This is why I bought the oil for as was having terrible problems with grapeseed base. I would however say that you do need just a little more oil during treatment as does dry quicker. Had your 500ml bottle of Therapeutic Massage Oil for sometime, ever since it was recommended for my first massage course in 2008, I prefered to use base oils even Arnica oil. Then recently having run out of other products I decided to use Physique's Therapeutic Massage Oil at a Hash Harriers running event. Wow !! the response from my massage clients was exceptional. Quote, What a lovely smell ! What oil am I using? This was some of many favourable comments especially amongst the ladies. Not having heard so many favourable comments before with other oils and after my first and only session using this oil, I have now decided to order this oil for my future use. You see most clients don't make a big deal with what oil you use, as long as you ask them if they have had any allergic reaction with the oil, and in this case the essential oils used in this lovely oil. This was a case of a very favorable reaction. First time using this multi purpose massage lotion and it is escellent every day product providing a nice glide, not greasy and fresh subtle scent which i hadn't anticipated! I love this product. Great to use, smells nice and not oily. It used to come in a pump dispensing bottle. Wish it still did. Not having a pump dispensing bottle is a real faff! In a word "Beautiful". Lovely fragrance to keep me and my clients happy and works like a dream. Cleanest oil I've found, and will save money on less washing powder used to get the sheets clean. I work as a massage therapist and all my clients love this oil. It smells lovely and the fragrance is equally suitable for both women and men. Very easy to use and not sticky at all. I have used a variety of oils in the past and have come back to this one as it can't be beaten both on price and performance. The best I've used so far - not sure how it's taken me so long to find it. Clients love the smell and feel of their skin after a treatment. They often take an egg cup full home - small pleasure but worth it!